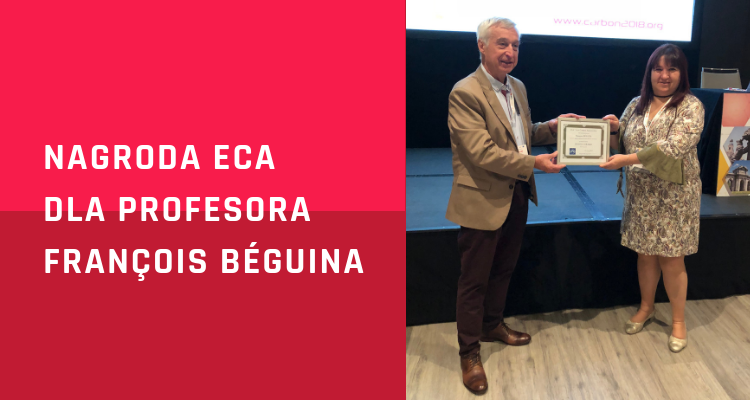 Professor François Béguin was awarded the European Carbon Association (ECA) prize during the World Carbon Conference 2018 in Madrid. This prestigious award is granted every three years on the recommendation of the ECA Award Committee for “remarkable service to carbon science community” as well as ” having been influential and supportive towards others in the pursuit of scientific excellence or having made a significant contribution in providing a strong foundation to the community of carbon scientists and technologists in order to promote a flourishing and healthy environment for scientific achievement”. Professor Béguin, being in the years 2000 to 2006, the president of the French Carbon Group, stimulated the cooperation between Polish and French scientists involved in the research on carbon materials. In that time, he supported the Polish Carbon Society in its efforts to gain the right to host the CARBON 2012 conference in Cracow. Prof. Béguin led the research work of the Energy and Environment Group in Orléans University (France) till 2011. From 2011, he is a Professor at the Faculty of Chemical Technology at the Poznan University of Technology. After moving to Poznań, he contributes actively to the work of the Polish Carbon Society. His scientific activity deals with chemical and electrochemical applications of carbon materials with controlled porosity and functionality. He is one of the most outstanding experts in the world in the field of applications of carbon nanomaterials for energy conversion/storage and environmental protection. Professor Béguin is the author of over 260 articles, a co-author of numerous books on energy storage and carbon materials. His scientific works are highly appreciated, the number of citations exceeds 12,500. He is the originator and chairman of the Advisory Board of the CESEP conference (Carbons for Energy Storage and Environment Protection), a member of the International Advisory Board of the World CARBON Conference, a member of the Editorial Board of the journal Carbon. Until 2012, he was the director of several national programs of the French Research Agency (Energy Storage, Hydrogen and Fuel Cells, PROGELEC).